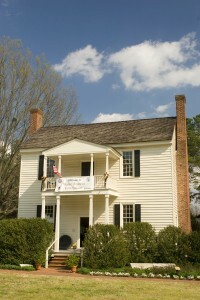 The Calvin Jones House near the Old Campus. Susan Powell Brinkley loves old Wake Forest as only an alumnus who walked the magnolia-lined campus with Dr. Billy Poteat or Bull Memory or Skinny Pearson could. Watch Susan Brinkley on North Carolina People. For all her love of the Old Campus, Brinkley never set foot on that campus as a student. Instead, she was in one of the first classes to enroll on the “new” campus or the campus in Winston-Salem, as she might call it, and graduated in 1962. But for the last 20 or so years, she’s been one of the most passionate advocates for preserving the heritage of the Old Campus and sharing it with students and alumni. For most of that time, she’s served as president of the Wake Forest College Birthplace Society, which oversees the historic Calvin Jones House and the new Wake Forest Historical Museum. 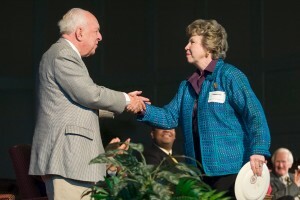 Susan Brinkley (’62, P ’93) received the Distinguished Alumni Award from Provost Emeritus Edwin G. Wilson (’43) in 2000. “It truly has been a passion for me, because I feel so strongly that the University needs to reflect on its background, and it has to do it on location where it happened,” Brinkley says. Brinkley swapped stories of the Old Campus with Bill Friday on his “North Carolina People” television program on May 25. You can watch the full program here. Friday has maintained a soft spot in his heart for Wake Forest since going to school for one year on the Old Campus before transferring to N.C. State in 1938. He went on to have a distinguished career as president of the University of North Carolina system. He spoke at the Birthplace Society’s annual meeting last fall, and had Provost Emeritus Ed Wilson (’43) on his television program in December. Brinkley loves nothing more than sharing tales about Old Campus personalities and characters: legendary professors such as Cronje Earp (’26), Lewis Aycock (’26) and Broadus Jones (1910); coaches such as Peahead Walker and Murray Greason (’26, P ’59); “Miss Jo” Williams, whose 16-cents breakfasts were popular with students; and “Dr. Tom” Jeffries, the gardener who built the wall around the Old Campus and was so revered that faculty carried his coffin at his funeral. 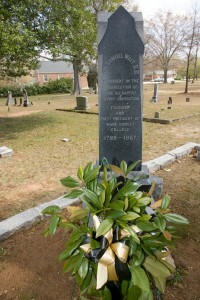 Samuel Wait’s tombstone in the town cemetery. And the next time you’re in old Wake Forest, you must go to the cemetery, where four Wake Forest presidents (Wait, Wingate, Taylor and Poteat) are buried, along with dozens of faculty members, countless alumni and Civil War soldiers, and Shorty Joyner, of Shorty’s fame. She’s still indignant that Poteat’s and Taylor’s tombstones don’t even mention that they were presidents of Wake Forest. She married a N.C. State grad, Sherrill, and they eventually settled into an old plantation house — the 1790s Harris house — near the Old Campus, where they raised goats and chickens and four children. 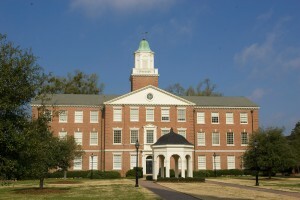 (Daughter Sherilyn graduated from Wake Forest in 1993). 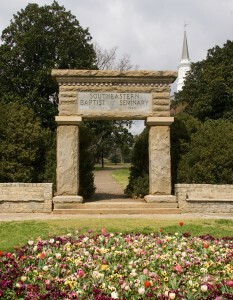 The entrance arch on the Old Campus, with Binkley Chapel in the background. She found a bit of Wake Forest heritage, of the scandalous nature, in her own house. The boys of Wake Forest College — where dancing was strictly forbidden of course — would secretly meet the town girls at the Harris house for a night of dancing. E.E. Folk (’21), then a student and later an English professor, met his future wife there. “If that place could talk, it has great stories,” she says. She joined the board of the Birthplace Society in the 1980s and was named president — a volunteer position — in 1991. When Kathleen Mackie-Lake (P ’60) gave her the keys to the Calvin Jones House, she was terrified to even move anything in the house. But when she noticed mold on the portrait of Samuel Wait one day, she began pushing the University to care more about its heritage. In 1996, then-President Thomas K. Hearn Jr. announced that the University would give $10,000 a year to preserve the Calvin Jones House. The University increased its support in 2003 to pay for an executive director for the museum. 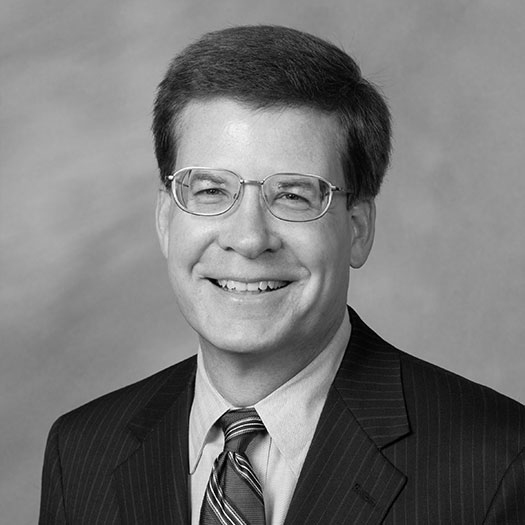 Ed Morris (P ’04) brought extensive experience overseeing state historical sites when he was named executive director in 2006. 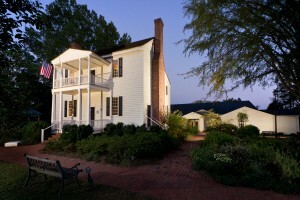 The Wake Forest Historical Museum, located behind the Calvin Jones House, chronicles the history of Wake Forest College and the town of Wake Forest. An impressive $2 million building — funded by the University, the town of Wake Forest and private donors — housing the Wake Forest Historical Museum opened behind the Calvin Jones House in 2010. With exhibits on Wake Forest’s history now shifted from the Calvin Jones House to the museum, Brinkley would like to see the house restored to what it once was: a home for President Samuel Wait and classrooms and living quarters for students. Brinkley is especially thrilled when students — such as those seniors who visited the museum last week right before graduating — drop by to visit. Why should they care about a place Wake Forest left 56 years ago? She tells them to look for the connections between the two campuses. It’s in the campus architecture and magnolias and the buildings honoring Old Campus presidents (Wait, Wingate, Taylor, Poteat, Kitchin, Tribble) and streets honoring Old Campus professors (Easley, Timberlake, Sledd, Memory, Gulley). It’s in the traditions of academic excellence and friendliness. It’s in cherished athletic traditions; in the museum, students can see an ancient pin depicting a tiger, the first mascot, which was later dropped, but the black and gold colors retained as the school’s colors; and the top hat and coat worn by Jack Baldwin (’43, P ’70), the first Demon Deacon. Wait Hall and a replica of the Old Well on the Old Campus, now home to Southeastern Baptist Theological Seminary. Brinkley is retiring from the Birthplace Society board this fall. With a strong board and executive director in place, and an able successor in Tom Parrish (’67), it’s time for younger alumni to take over, she says.